There seem to be a growing number of practitioners adopting yogic practices for physical, mental and emotional well-being. If one were to ask a practitioner what is the motivation for the practice of yoga, the answer might include: to lose weight, improve concentration and to reduce stress. However, if one looks at the tradition of yoga and examines how the system is designed, the end goal seems to be an evolution in consciousness through the physical, mental and emotional bodies. In the science of yoga, in order to transform daily experience, the physical body is first addressed. 'Asana' is a tool to understand and hence improve the functioning of the body. The key to a healthy immune system is the functioning of the 'prana' or the air element within the body. Through effective asana practice, the prana is re-distributed through the body as the blockages in the pranic passageways are cleared. Muscular coordination, improvement in the functioning of the various organs and the ability of the body to respond and adapt to changes in the exterior environment are some of the effects. There has been much research in recent times as to the health benefits of asana and pranayama practice and the types of ailments which can be reversed or prevented. That the mindful practice of asana has health benefits is perhaps accepted by the majority. There however seems to be less awareness about the mental and emotional bodies and the practice of yoga to understand and transform these. It is quite clear in the tradition that the physical body was seen as an entry into the mental and emotional realms. As one proceeds in the practice, there is a shift from observing the physical to observing the mental and emotional bodies. For the ancient yogis (and also some modern scientists), the body and the mind were seen as inseparable. Rather than being of the opinion that the mind had a location in the head, the yogis saw the mind as being located throughout the body. As the pranic blockages are cleared in various parts of the body, mental health of the practitioner is seen to improve. Physical relaxation and concentration go hand in hand and the asana is seen as a tool to relax the body and focus the mind. If one speaks to long term practitioners of yoga, they could report an increase in mental clarity, a quietude in the mind, an increase in concentration and similar mental effects. As the practice deepens, there is an understanding of how the emotional body is connected to the physical. By a constant renewal of the physical, there is a renewal of the emotional body. Emotional holding patterns which are the cause of much stress are largely related to conditioning from the past. Memories of the past are seen as being ‘stored’ in different parts of the body and are related to physical sensations. This relationship between memory and physical sensation is addressed in the path of yoga through the limbs of pratyahara, dharana and dhyana. When pratyahara (sense restraint), dharana (internal focus) and dhyana (single pointed focus) are applied to the asana practice, there is the opportunity to drop habitual patterns of thinking, feeling and responding which could be the cause of repeated suffering. The removal of such patterns bring about a transformation in the identity of the practitioner. The tradition speaks about an evolution in the level of consciousness by such a transformation of the physical, mental and emotional bodies. The practice of the yogi is then a study of consciousness itself. There is an interest in how the exterior world of name and form is intimately related to the internal world of sensation, thoughts and emotions and how a manipulation of the internal affects the external. 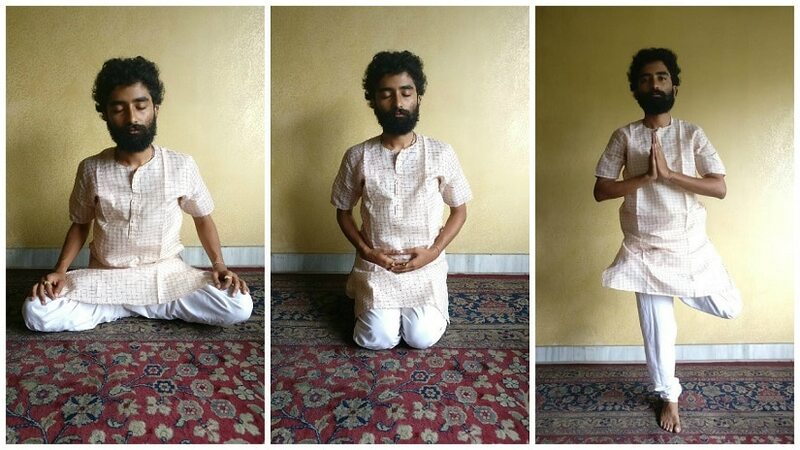 Keshav Mohta has been trained in Satipatthana Vipassana (insight meditation through mindfulness) in the lineage of Mahasi Sayadaw under Patrick Kearney and is a certified yoga teacher from The Yoga Institute, Santacruz. Follow his writing here.